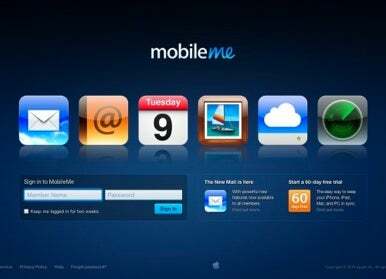 Early Friday morning, Apple released an anticipated update to its MobileMe Web apps, as well as a new Find My iPhone app. The MobileMe Mail beta that we took a first look at last month is now available to all members, and Apple even added some surprises. Besides a redesigned sign-in page, Mail received the most significant update, gaining both a major interface redesign and some new features. It now defaults to a three-column view with folders on the left, a top-to-bottom message list in the middle, and a tall reading pane on the right. Users can now set filtering rules online in MobileMe Mail, which makes organizing mail before it hits your inbox more convenient. Other new features include a one-click message archive option (like Gmail), rich-text formatting when composing messages, endless scrolling through the message list (no "click for [X] more messages" button needed), a third view mode in case you don't like the three-column view, significant performance improvements, and more. Apple added a couple of surprise features to MobileMe Mail for today’s release that weren't in the beta: sending mail from an external address and improved junk filtering. Sending from external addresses has been a longtime advantage of Gmail and even Yahoo Mail Plus (the latter requiring a subscription fee) and it allows users to prove that they own a non-MobileMe e-mail address and send messages from that address using the me.com site. If you have a lot of e-mail addresses, MobileMe Webmail has joined the ranks of the few tools that lets you fully manage mail for those addresses in one place. Junk filtering also received some attention since the MobileMe beta. Now, when messages are suspected to be junk, MobileMe moves them to the junk mailbox automatically (in fact, junk options have been removed from MobileMe Mail's preferences entirely—this is on by default and not configurable). If a message is genuine, you can click the "Not Junk" button in its header to move it back to the Inbox. The only other app that seems to have received a major redesign is Find My iPhone. Instead of a small map and a list of options with descriptions below, almost the entire page now becomes the map, save for a left sidebar that contains entries for each device that you have tied to your account. Click a device in the sidebar and it is quickly displayed on the map with an iPhone-like popover. You can click the popover to reveal Find My iPhone options like playing a sound, displaying a message, or wiping the device. The rest of Apple’s MobileMe Web apps did not receive such a sweeping feature update or redesign as Mail and Find My iPhone did, except for the new navigation interface. All apps now feature Mail’s top bar of iPad-like buttons, and gone are separate buttons for each MobileMe Web app. Now, users can click the cloud icon in the top left corner to display a MobileMe app switcher similar to the Command-Tab switcher in Mac OS X. You can use the mouse or keyboard to pick MobileMe apps in this switcher, which includes Find My iPhone but no longer the Settings icon. Account settings and help options have moved to the far right under a menu titled with the name of the user currently logged in. 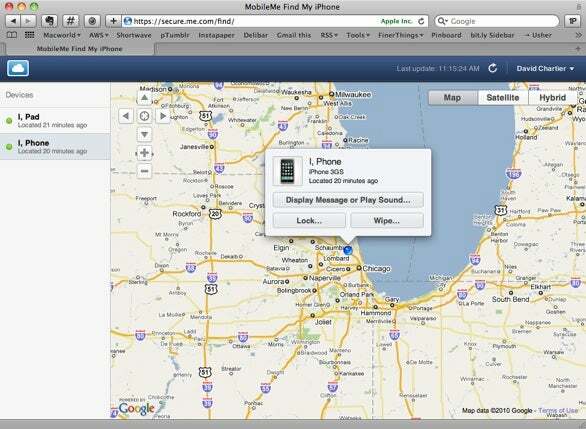 Besides MobileMe on the Web, Apple released a new, universal Find My iPhone app for the iPhone and iPad. If someone loses their device, they can enter their MobileMe credentials into this app running on a friend’s iPhone or iPad to locate it. Users can also remotely set a passcode lock on their lost device, display a message for anyone who found it, or remotely wipe it to protect sensitive data. Apple’s Find My iPhone app will automatically log you out after 15 minutes to maintain your privacy. The MobileMe Web app changes are available now to all MobileMe users. 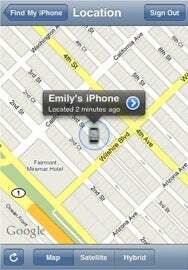 Find My iPhone is also available now for free in the App Store, and it requires iOS 3.1.3 or later. Updated 6:40am PT with further details on MobileMe changes, including endless scrolling, improved junk handling, and the new sign-in page. Updated 9:37am PT with Find My iPhone redesign details. Apple's updated syncing service is a disappointment for PC users.